(From left) Rapid City councilmembers Darla Drew, Ritchie Norsdtrom and Lisa Modrick listen on as Councilmember Jason Salamun speaks of potential compromises that a new parking policy proposal could include. 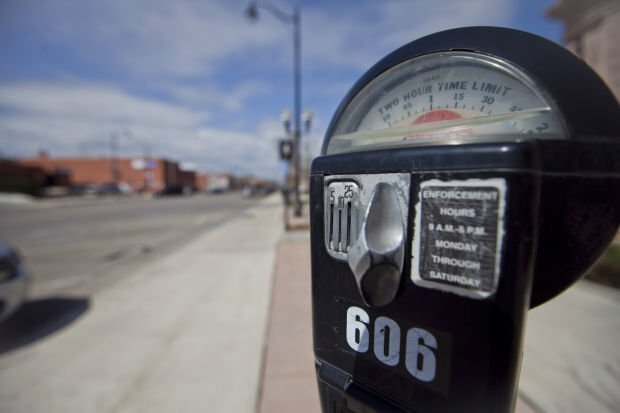 The Rapid City Council unanimously approved on Monday night the first reading of a pair of ordinances authorizing the installation of downtown parking meters and overhauling parking regulations. A final vote is scheduled for May 6. During Monday night's meeting, council members talked of altering the proposed parking policy to reduce fines and increase hourly limits for free parking on city side streets. Three business owners attended to voice their thoughts on the proposal, which ranged from support to concern. "We must have a fighting chance to do business without discrimination from a parking standpoint," said Erin Krueger, co-owner of 5th and Main Furniture by Freed's. Krueger said that the free two-hour parking the proposed policy would allow in front of her store could potentially be abused by downtown visitors seeking to avoid meters just one block over. City long-range planner Sarah Hanzel said policy specifics are not spelled out by the amendments in front of council and that changes to it could be implemented by the seven-person parking board that the ordinances create. Several members of the council appeared supportive of lowering the policy's proposed fine of $25, which some business owners have said is too steep an increase from the current $10. "I do believe there is some room for compromise in this plan," Council member Jason Salamun said. City officials expect that the 620 meters – which could be installed as early as June along Main and St. Joseph streets between Fifth and Ninth streets, and along Sixth, Seventh and Ninth streets – will rake in an additional $2.5 million in revenue over their first five years. Their deployment would do away with free three-hour parking in the downtown core. Meters would charge 25 cents for 15 minutes of time with a $1 minimum for card users and accept payments by mobile app. They also feature buttons that grant 15 free minutes of time for quick shopping excursions. The ordinances would create a parking permit program, with zones proposed for Main Street and St. Joseph streets from East Boulevard to Fifth Street, Kansas City Street from First Street to West Boulevard, Quincy Street from Fifth Street to West Boulevard and parts of Mount Rushmore Road and Sixth, Seventh and Apolda streets, all of which would also allow free two-hour parking. Some business owners, including Elks Theatre owner Curt Small, have said a three-hour limit would be better for customers. Permits, which residents can apply for starting next month, would enable holders to park on specific blocks for $30 a month with proof of residency. Parking in city lease lots could cost anywhere from $30 to $50 a month depending on the lot. Several members of council said the creation of the parking board would allow the city to react to feedback more quickly than their body can on its own. "This is the framework that we need to approve," Council member Steve Laurenti said.